Many people have reported faces appearing in photographs of orbs. Some see resembalences to family members that have passed on. 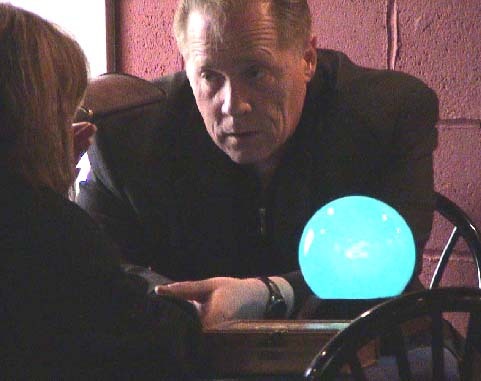 Many paranormal Investigators believe tat orbs in ghost photos need a second look and investigation to see what proof lies in their existance as ghost. Orbs are believed or thought to be balls of small floating bubbles of light energy. Many believe they are deceased ghostly life forms, and are believed to be the actual photographic proof of the human soul or life force. Many Ghost Hunters/ Chasers or paranormal investigators encounter them during haunted investigations frequently. Ghostly orbs can appear to be be completely transparent, or display themselves in a bright solid hard light forms. It is not hard to capture them on film in their circular form. It is theorized in many forums that ghosts prefer the form of an Orb (ball or bubble of light) because it takes less physical or mental energy, thus being the mode of choice among the dead. Others say they believe actual ghost feels or thinks they are in solid human form or shape, and it is that on this dimension (ours) that we receive them as an orb. The general open consensus is that small orbs take up the least amount of energy and apparitions and other fuller shapes take up the most. Also See: Lumen Pestis, Orbs Defined here. Orbs are generally agreed to be small spheres of varying sizes, colors, and opacity appearing primarily in photographs and alleged by some to be a form of basic spirit energy in the genesis of manifestation. Very seldom seen in any verifiable form with the naked eye, the onset of affordable home digital photography in the mid-1990’s has overwhelmed the field of paranormal inquiry with a flood of orb and orb-like phenomena appearing in hundreds of photographs submitted as “proof” of the existence of ghosts and the supernatural. Though often the photographs were the result of legitimate investigations into the veracity (or lack thereof) of hauntings in particular locations, the vast majority of orb photographs have originated with groups of avid “ghost hunters,” hobbyists, really, during eager “investigations” in cemeteries throughout the hills, plains, and backwaters of the US and Europe. Occasionally, and with increasing frequency, it might be noted, orbs have appeared in photographs taken at other locations with no connection whatsoever to hauntings, such as the homes and workplaces of these intrepid paranormal enthusiasts. These orb manifestations have been just as eagerly documented and often generate a proliferation of initial excitement among the enthusiastic little groups involved – surely, they insist, this is only further proof of the existence of ghosts and the supernatural? ORBS: Dust / Water / Insects ? Experiments have shown us that orbs can be caused by dust and water droplets lit up by the flash . This is also the official explanation offered by several known sources. Insects can also reflect the flash of the camera. As can water vapor or dust in the air. Described as 'spirit energy', a manifestation of a departed soul. Spirit guides or angels. Orbs are often seen in conjunction with ectoplasm, a kind of spirit 'mist. Another theory puts forward the idea that orbs are a kind of viewing device for multi-dimensional beings. A further, very plausible explanation, is that true orbs are somehow related to 'earth lights', 'ball lightning', 'earthquake lights' and other anomalous light sources. Ball lightning and earthquake lights are now being recognized by mainstream science. How long before scientists find evidence for other supposedly paranormal phenomena? Submitted ghost photo from John Clemens, I was recently on a mission trip to south-eastern Iowa. The house in which I was staying noises were frequently heard. We continually heard laughter coming from the guest bedroom which was not being used. Footsteps were also heard, although less frequently than the laughter. The feet outside our door were usually heard shortly after the laughter. It would occur from 2am to about 5am. It happened most of the nights we stayed in the house. The woman that owned the house told us that the house was the site of a lynching. This months fresh Ghost Pic's! View and share ghost stories and photos. Rate ghost tours and haunted locations. General ghost discussion. GHOSTS - Real Ghost Pictures and ghosts! Explore the wonderful world of Ghosts with these cool top ten lists! VISIT HERE TO APPLY TO RIDE IN A REAL NEW ORLEANS MARDI GRAS PARADE. THIS IS THE ULTIMATE MARDI GRAS EXPERIENCE OF A LIFETIME!